It’s time to WOW everyone with breathtakingly gorgeous hair! Glossy shine, enriched volume, healthy bounce and superior environmental protection — achieve these vital hair features effortlessly thanks to the GKhair Shield Series. The new product line still retains Juvexin, GKhair’s signature anti-aging keratin protein blend optimized for restoring dry, damaged hair to a healthy, youthful state. The Shield Additive + from GKhair effectively fortifies the hair shaft, leading to healthier and stronger hair. It is the best hair defense and is intended for optimal protection of each and every hair strand. The Shield Additive + formulates new bonds in the hair cortex while protecting the natural structure of your hair from damage. You will find it especially useful if you have exposed the hair to harsh styling chemicals, such as developers, general color products and bleach. The Shield Additive + complements other GKhair solutions, such as Juvexin 86-shade Cream Color and Shield Juvexin Conditioner and Shampoo. The professional Juvexin Cream Color is an 86-shade line complemented with a Bleaching Booster. It is an advanced formula designed to yield lasting colors while fortifying the hair fiber with GKhair’s signature ingredient Juvexin and Ceramides. The Juvexin Cream Color offers optimal durability, brightness, shine and 100% grey coverage. 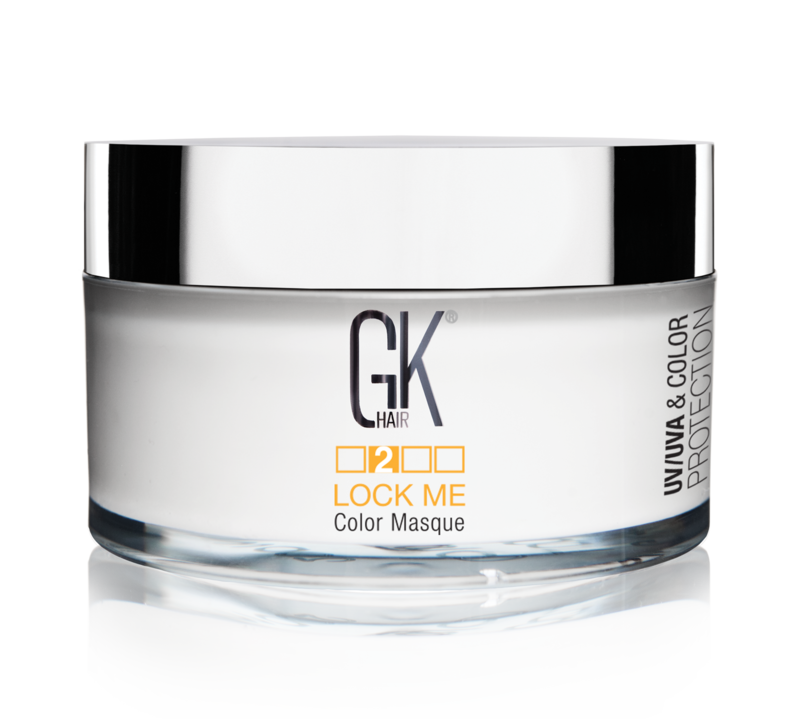 The Lock Me Color Masque can be used in combination with other GKhair products. Applying it after the GKhair Shield Additive + will enrich the newly formulated bonds in the hair. It is recommended to leave it on hair for 5 minutes before properly rinsing the hair with water. Infused with GKhair’s signature ingredient, Juvexin, this product is solely meant for prolonging the intensity of hair color while eliminating frizz. It helps you flaunt perfectly-colored hair with utmost manageability that lasts long. It is highly enriched with natural organic extracts to suit all types of hair – including sensitive hair and scalp. It effectively locks in color to each hair strand from roots to tips to keep your hair looking as vibrant as the first time you stepped out of the salon. Its naturally derived nutrients fully nourish the hair from within and let you enjoy your hair’s gorgeousness for up to 2 months. The Juvexin Color Sealing is a specialized in-salon product meant to be used in combination with the GKhair Juvexin Cream Color application. This also features UV/UVA protection to prevent hair damage due to harsh sun exposure and environmental elements. With the Juvexin Shield Series Shampoo and Conditioner, you can incorporate professional salon hair care to your daily routine. Think your fashion hair color fades too quickly? That’s about to change with the GKhair Juvexin Shield Series Shampoo and Conditioner. The shampoo and conditioner formula is formulated with the help of salon professionals and hair experts to ensure hair vibrance that lasts. What’s more, it also offers color and shield protection from the harmful UV/UVA rays, preventing hair frizz and damage. GKhair’s new and refreshingly soothing Dry Oil Shine Spray adds an extra layer of weightless hair protection while bringing out your hair’s natural shine. It also provides odor elimination and enhances with a fresh, floral scent. The Dry Oil Shine Spray is the best nourishment and protection regimen for your hair when they are exposed to harmful pollutants in the air, odor and other elements that are outside your control.